With the beginning of a new year, we have a big announcement! First we have added a new topic to the usual line-up of issue topics – Palliative Care for ANS 39:3 with a manuscript submission date of January 15, 2016. In addition, we are introducing the “Open Topic,” which makes it possible to submit your manuscript at any time! During the manuscript submission process, if you select “Open Topic” on the list of future issue topics, your manuscript will be entered into the peer review system, which should be completed within about 8 weeks of submission. Once your manuscript has been favorably reviewed and accepted for publication, it will be scheduled for the next available issue. 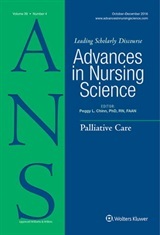 ANS issues will still include manuscripts that are focused on the scheduled issue topic, but will also include “Open Topic” articles that generally address the purposes of ANS, which are to contribute to the development of nursing science and to promote the application of emerging theories and research findings to practice.